The exhibition at Grand Hyatt has in attendance 70 artisans from six states — Madhya Pradesh, Bihar, Jharkhand, Odisha, Telangana and Andhra Pradesh — coming together to design more than 3,000 products, including hand-crafted beads, papier-mache jewellery, ikat saris and leather puppets. We use this to catch fish during the monsoon months of August and September,” says Amit Turi, a handicraft artist from Gumla village in Jharkhand. The 31-year-old was pointing towards kunni, a fish trap made from bamboo that his family has been weaving for decades, apart from producing tokris to store grains and bamboo furniture. “We also work on our farms for a large part of the year but everyone in our village is involved in making handicrafts,” adds Turi. 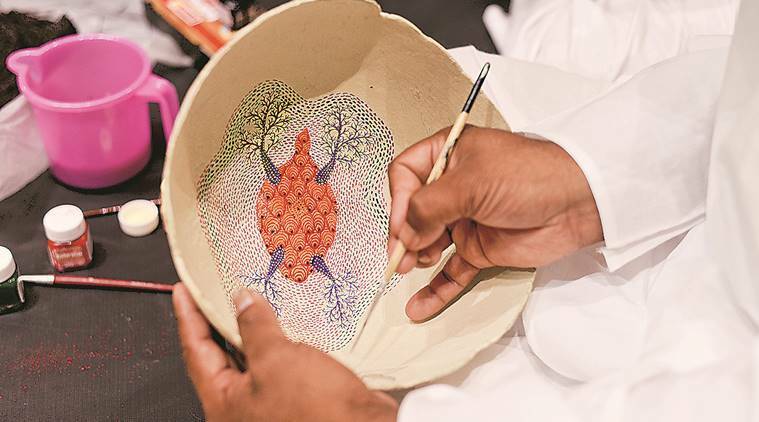 The exhibition at Grand Hyatt has in attendance 70 artisans from six states — Madhya Pradesh, Bihar, Jharkhand, Odisha, Telangana and Andhra Pradesh — coming together to design more than 3,000 products, including hand-crafted beads, papier-mache jewellery, ikat saris and leather puppets. There are also food items such as pickles, preserves, jams and jellies. “I am glad that because of Jiyo I am able to show people the work that we have been doing in our villages,” says Gudya Devi from Muzaffarpur district, who does sujini embroidery. Also seen interacting with the audience were designers from Sethi’s team. Malvika Vaswani, for instance, spoke about her experience of working with women in Bihar who use sikki grass to design accessories. “The idea is to keep things as simple as possible and use as little artificial products such as dyes,” says Vaswani.